Sun Khosi, meaning ‘River of Gold’ its life begins in Shisapangma, the 10th highest peak in the world in Tibet. 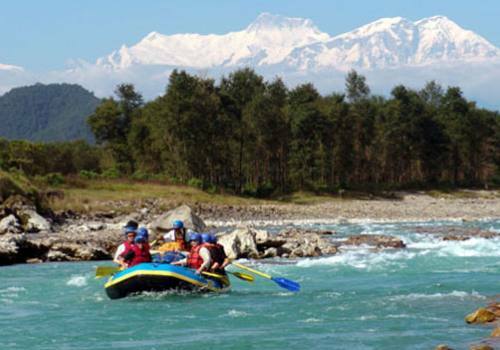 This big river has been rated s one of the top ten river rafting trips in the world and listed as ‘must to do while in Nepal’ and runs downwards to Nepal through the Nepal’s most remote and unspoiled places draining the highest mountains before it emerges in plaints to join Ganga River in India. The Big rapids journey is 270km in warm water, no roads or towns, beautiful scenery and great camping makes this trip a classic multi-day river trip. 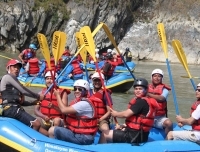 A unique and an excellent experience of wilderness trip for intermediate or advance kayakers. Rafters should be reasonably fit and comfortable on big water. T-shirt, swim wear for on the river, warm clothing for the evenings, fleece or a pullover. Flashlight, Footwear, Reading book, fishing hook if you do fishing. After three-hour drive from Kathmandu to Dolalghat expedition starting point on the Sun Koshi River. After the usual briefing and preparations, the trip is on. The river looks deceitfully peaceful and lazy and soon local villagers are encountered. Lunch stop is at a lovely sandy beach. One of the rapids encountered along the way on the first day is Kooyeh Bhir. There are villages and temples on the way until campsite is reached a few kilometers above rapid Meat Grinder. While some opt to help the crew to pitch up tents, others can spend time exploring the surroundings. Have breakfast and pack up gear and start rolling down the river lies the first Class III rapid, Meat Grinder. The path to choose is straight through the middle avoiding holes on either side. A few kilometers down and the confluence of the Tama Koshi or “River of Copper” and Sun Koshi are encountered. After a lunch stop, there is ample time to explore the landscape and see different ethnic groups along the river. The second camp is set up above the rapid Punch and Judy. The day ends with a dinner by campfire. The valley here is always changing in terms of its width. At Bat Cave, the crew takes the rapid seriously. The size of the rapids on this river can surprise you. It is time to stop and scout and eventually decide on the most exciting route through. Here people of the ethnic group called Newars always wait to see the adventurers pass by. Floating down after lunch, the water splashes across the boat but the waves are no threat. Later, a nice stretch of sandy beach is chosen for the campsite. The monsoon floods deposit large amounts of white sand which seem ideally made for camping. 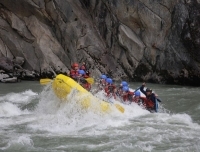 Today, a number of small to medium sized rapids are encountered. 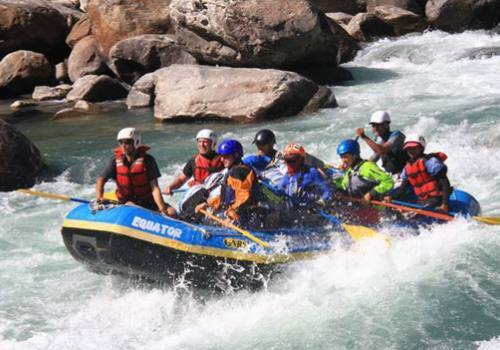 A few kilometers below the confluence of the Likhu Khola a long Class IV rapid named Likhu Rapid is encountered. Soon after lunch the ride takes one across interesting rock formations on the walls. The white water gets more exciting and the day ends at a campsite near a small village called Harkapur. For a change it is possible to visit a local tea shop and even shop for wares. Camp there. Some kilometer below Harkapur, Sun Khosi meets Dudh Kosi, there the river widens into an arid area of gravel, the river valley broadens to almost 2 kilometers across. In the afternoon run, a number of small rapids are crossed on the way. The next stop is near Rasuwa Khola and we camp there. 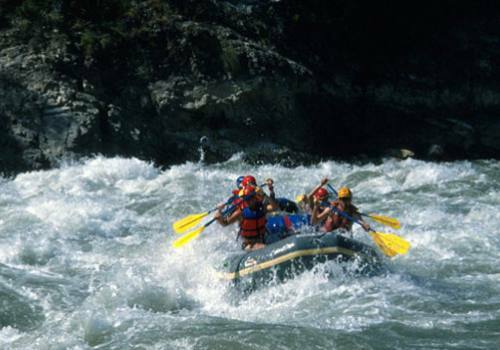 A hard day with full of thrills as there are many rapids to face. Starting with small rapids, they get progressively bigger and longer. One of these is Jaws, a challenge with a huge hole at certain levels. Even the smaller ones are fun and the afternoon is full of them until Rhino Rock, a Class III rapid is encountered. This lies just above the next bridge and heralds the beginning of the “Jungle Corridor”. It is then time to halt for the night and set up camp. The gorge forces the water to flow through a narrow opening which is thickly forested. Along the way are a succession of rapids such as Cooper Chin and Black Hole, etc. Today there is an opportunity to shower under some waterfalls, an invigorating experience. As the gorge is maneuvered, rapidly changing scenery unfolds. Camp for the night is set up near a waterfall that drops down from a height of four hundred feet. This site is a few kilometers from the last major rapid, the Big Dipper. Today, everyone is looking forward to the Big Dipper. 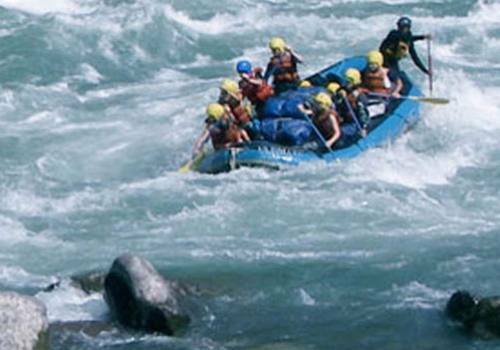 This rapid is a series of standing waves with holes that can create quite a bit of trouble. This must be inspected carefully and the right strategy adopted to tackle it. Soon the waters ease out and the afternoon float is enjoyable. There are many spectacles today; watching cremations, logging of bamboos or people being ferried across in dugouts. This region has a strong presence of the Rais and Limbus who are collectively known as Kirants, descendants of ancient rulers of Kathmandu valley. The confluence of the three main rivers of eastern Nepal: Arun, Tamur and Sun Koshi is a good camping spot. 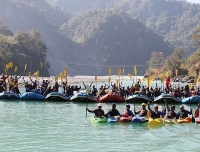 The river then becomes part of the Sapta Koshi (the Seven Koshis). The last day on the river starts with a visit to the popular Hindu temple at Barah Chhetra below Tribenighat, which is the meeting place of the three rivers. Full moon here in January brings thousands of Hindus who come to worship at the temple. The pilgrims arrive to celebrate Lord Vishnu’s victory over a legendary Demon. 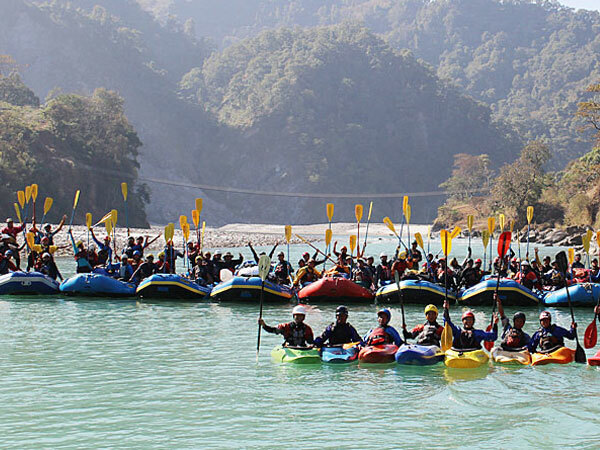 After lunch on the beach, the fabulous Sun Koshi river trip ends at Chatara and the drive back begins with fond memories of the nine-day journey through gorges and challenging rapids. About 2 pm we leave for Kathmandu. Free airport – hotel – airport pick and drop off. 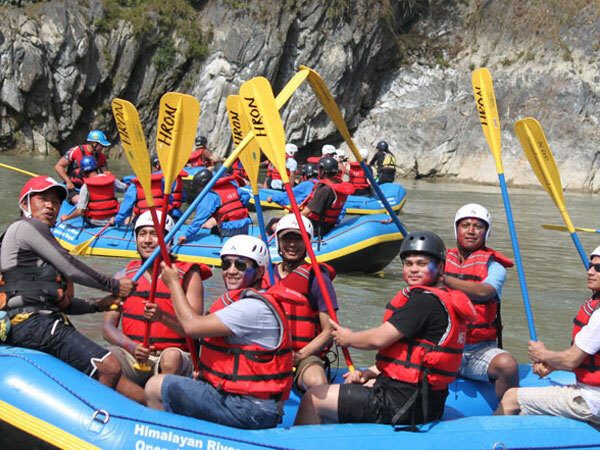 All ground transportation and experienced adventure guide with safety assistant. All bar bills, beverages such as mineral water, coke fanta etc. Emergency evacuation, internet, phone calls, things of personal use. Your insurance, tips and gratitude for your guide and assistants.